It was like someone turned down the Sun with a dimmer switch. The tempurate dropped quickly, enhanced by the lack of moisture in the dry mountain air. In a span of an hour, the Sun looked the same, but was very different, as totality approached. I was taking photos through my telescope with an attached solar filter, so I could see the Moon slowly covering the Sun. But as the environment changed in Northern Wyoming, I grew more excited for what was to come. Over a year of preparation for this event, and clear skies greeted me with the confidence that I would experience it to the fullest. Seconds before the great event, a dark shadow drew across the peaks of the Grand Tetons to the West, and I braced for a life-changing experience. Photos don’t do it justice. It’s hard to capture the feeling, the sight of twilight across all horizons, the deep blue-black of the sky, the visibility of stars and planets overhead, the excited cheers of people nearby, the starnge noises of confused creatures all around, and the gorgeous ring of the corona of the eclipsed Sun. For only 2 minutes and 15 seconds, I raced to set the camera to capture images, before spending some time taking in the sight. What a feeling to experience an event far greater in magnitude than any Earthly phenomena. The alignment of a massive star 150 million Km away, a perfectly placed Moon 400 times closer and 400 times smaller, and me, a tiny mammal in the right place at the right time. At that moment I was so grateful to be a product of 4.5 billion years of evolution and thousands of years of scientific progress, because it gave me the capacity to understand what I was seeing, to revel in the beauty of the universe and to experience awe at how truly lucky I was to see it. As one tiny being on one tiny planet around one normal star, I felt connected to the immense and incredible universe I am part of. 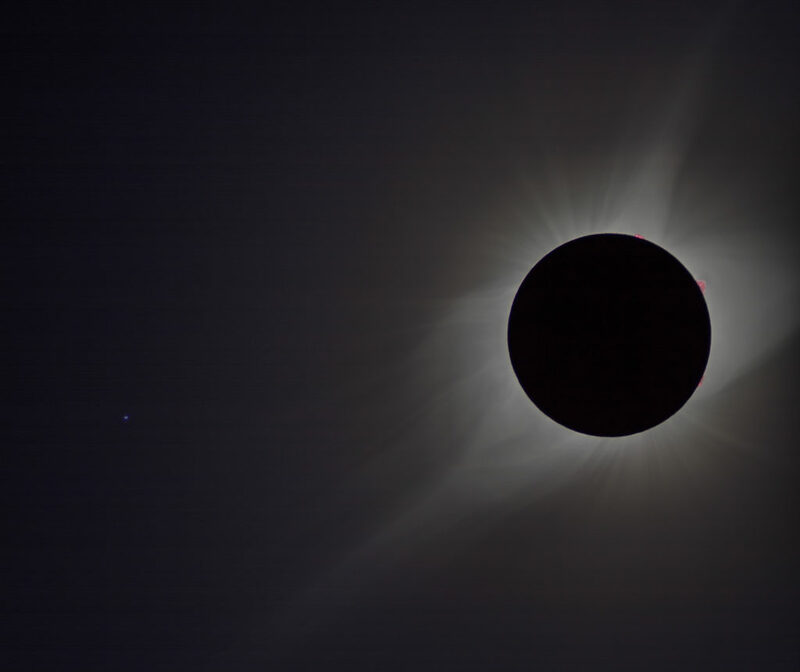 As the totality ended, the ‘diamond ring’ effect greeted me as a reminder to use my eye protection once again, and to replace the solar filter on my telescope. Light returned to the Grand Tetons, and the temperature began to climb back to that of a typical warm summer day. An hour later, as the Moon’s edge finally separated from the Sun, a feeling of calm came over me as I had not only experienced it fully, but photographed the entire thing.